LAS VEGAS, NV — Mushkin on Wednesday formally announced its lineup of M.2 SSDs that it will be offering this year. All the drives are based on various controllers from Silicon Motion as well as 3D TLC NAND memory. Mushkin’s fastest Pilot-E-series SSDs will offer peak sequential read speed of up to 3.5 GB/s and will thus be aimed at high-end desktops. This year Mushkin will offer four lineups of SSDs in M.2 form-factor and will continue to offer three families of 2.5”/SATA drives that were introduced earlier, so it is evident that module SSDs are taking over, at least in case of Mushkin. 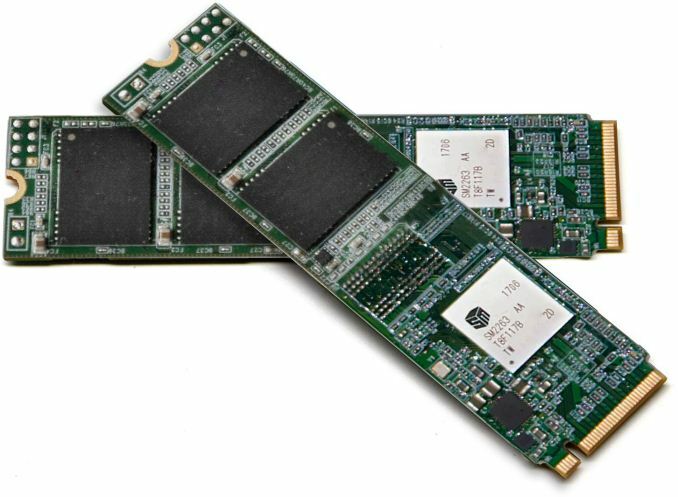 All of the new M.2 drives will use 3D TLC NAND memory (probably made by Micron) and will be powered (mostly) by Silicon Motion’s latest controllers featuring ECC engines based on LDPC methods. Needless to say, different drives will be aimed at customers with different budgets and needs. 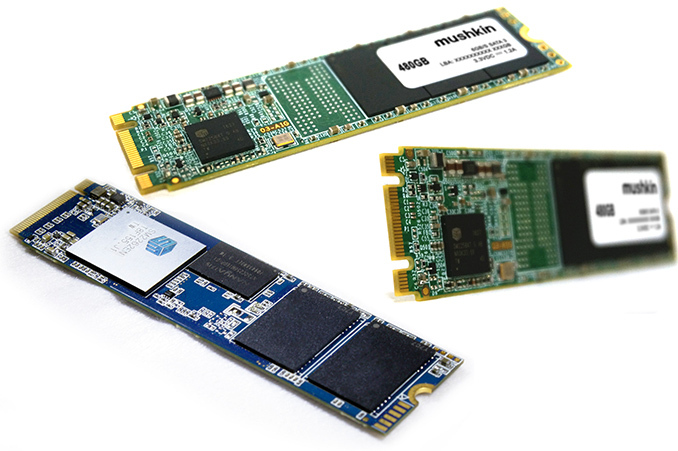 The entry-level M.2 SSD lineup from Mushkin is the Triactor 3DL M.2 based on the Silicon Motion SM2258XT controller and featuring a SATA 6 Gbps interface. The Triactor 3DL M.2 will be available in 120 GB – 1 TB configurations (note that Triactor 3DL in M.2 and 2.5" form-factors have different configurations and modules seem to reserve more memory for overprovisioning) and will hit performance levels one would expect from a modern SATA drive — up to 550 MB/s sequential read speed and up to 505 MB/s sequential write speed in case of capacious drives. Mushkin intends to ship the Triactor 3DL M.2 drives sometimes in February. A more advanced SSD family from Mushkin to be released in the coming months is the Helix-L. Based on Silicon Motion’s new SM2263XT controller for fast yet inexpensive SSDs, this one will use a PCIe 3.0 x4 interface and will be available in 120 GB – 1 TB configurations and will be DRAMless. Mushkin specs the drives for up to 2.4 GB/s sequential read speed as well as up to 1.7 GB/s sequential write speed, which looks rather good on paper. We do have an SM2263XT-based drive in our lab, but test results are not yet in, so we cannot verify Mushkin’s claims. The manufacturer plans to make the Helix-L products available in late February, or early March. Next up comes the Pilot, Mushkin’s new “extreme performance” offering powered by Silicon Motion’s SM2262 controller with a PCIe 3.0 x4 interface. Mushkin will supply Pilot SSDs in capacities ranging from 120 GB to 2 TB and equipped with a DRAM cache, thus targeting pretty serious PCs. Higher-end Mushkin Pilot SSDs support sequential read speed of up to 3.2 GB/s as well as sequential write speed of up to 1.9 GB/s, according to figures released by SMI and repeated by Mushkin. Random read/write performance of the Pilot is up to 370K/300K IOPS, but Mushkin does not specify exact models that offer such performance. The manufacturer expects to release its Pilot drives sometimes in February. Mushkin’s consumer M.2 lineup will be led by the flagship Pilot-E series based on Silicon Motion’s SM2262EN controller. The “ultimate performance” Pilot-E will be offered in 250 GB – 2 TB configurations and will be rated for up to 3.5 GB/s sequential read speed as well as up to 3 GB/s sequential write speed. As for random performance, it will be in line with the Pilot series. It is noteworthy that both the Pilot and the Pilot-E SSDs are not equipped with heat spreaders (at least, based on their press shots). Mushkin intends to launch the Pilot-E drives this March, but keep in mind that companies tend to spend time ensuring that their premium offerings deliver the best possible performance and reliability. Since pricing of NAND flash is fluctuating, SSD makers tend not to announce MSRPs of their products well ahead of their availability and two or three months is a long time when it comes to pricing of commodities (such as memory). That said, it is hard to predict prices of Mushkin’s new SSDs. Clearly, the Pilot and the Pilot-E series drives designed to hit maximum performance will cost accordingly, do not expect any bargains here. As for other products, let’s wait and see. With a Silicon Motion controller? I have my doubts. I'm in the same boat. I want a 2tb drive, not Samsung, but as fast as Samsung. (Samsung doesn't provide warranty coverage). They have a LONG distance usable in like 90% of case/motherboards where the flash slot is on the motherboard, it is the thickness (usually) that can be the problem, the motherboard makers and the SSD makers need communicate better, as although this "style" is the new thing, they are anything but low cost and at least IMO they are putting them in the most akward locations.